One of the most teenagers of all time, Anne Frank was a German Jew whose posthumously published diary became one of the most moving portraits of the Holocaust and Jewish persecution in history. Now, the only known video footage of the then 13-year-old Frank has become a Youtube sensation. Despite only being 21 seconds long, the video footage is incredibly rare and unfathomably valuable just as a curiosity. It has also been verified by the Anne Frank House as authentic footage. 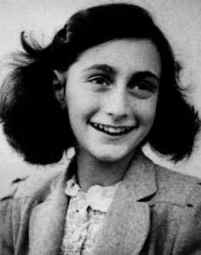 Anne Frank is probably the most famous person associated with the Holocaust (aside from Hitler). Unlike Oscar Schindler’s story, American school children grow up reading Anne’s diary, seeing performances of the play, and learning about the crimes of the Nazi party through the eyes of a peer. When I read it in middle school, it was more effective than any snippet of text book about the horrors of the gas chambers could have ever been, just because it was someone my age. Here’s the footage of Anne that was uncovered. She’s leaning her head out the window to watch a wedding procession on July 22, 1941. Given the scarcity of video cameras, we’re lucky to have any footage of her at all.